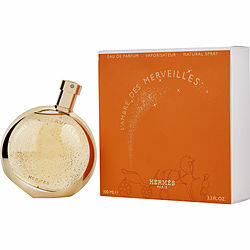 Hermes introduced L'Ambre des Merveilles in 2012 for the elegant, discerning woman. This deceptively simple Oriental scent has only four notes: a fruity vanilla top, a warm amber center, and a base of woody labdanum and patchouli. The full fragrance is stunning, offering a soft yet intense balanced amber breeze that is perfect for cooler weather, day or night. It is a mature, elegant, and sensual scent ideal for a special first date or an evening out. Lovely amber fragrance, warm and sunny type fragrance. I don't like this as much as I like other Hermes scents but it's nice.